Managing livestock means more than just dealing with the animals in our herds. It also means taking into account the animals that we live amongst. In some cases, grizzlies, and the humans who are there to protect them. This story was told to me by a cowboy in a bar when I was at an animal behavior conference in Idaho in late in February of 1999. The story touched me so powerfully that when we’d finished our beers and said goodnight, I went straight back to my room and wrote down what he’d told me as close to verbatim as I could. Here is his story. There is an allotment outside of Jackson, Wyoming where 800 cow calf pairs have grazed since 1912. One cowboy has watched over them and their descendants since 1980. 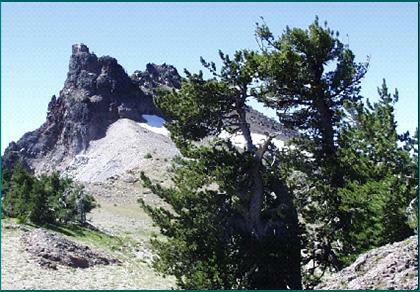 It is high meadows, lush grass, ridges and a patch of white bark pine. High elevation white bark pine. When it was originally suggested that this and another allotment be included in the recovery plan, the ranchers were skeptical. 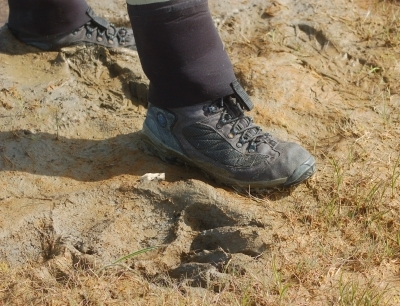 They were worried about the potential for grizzly bear predation and its effect on their operations. “Not to worry,” responded the Forest Supervisor. “If it comes to problems there’s a clause that says bears can be removed for excessive predation on livestock.” He was a good man, one they trusted, so they shook hands on it and the Recovery Plan was complete. Years passed and the bear recovered. And he recovered his appetite. Predation losses on the allotment went from 1 to 2 percent per year to 10%. The cowboy worried and discuss it with his partner, a man he described as having few teeth, but more worldly wisdom and common sense than most. Over a beer, the two men discussed the situation and solutions. “I think you should just kill ’em,” the old man growled. The cowboy pantomimed the coin toss for me, looking down at his hand where the coin had landed, lifting his fingers to reveal the”Heads” that meant he was calling Fish and Game. 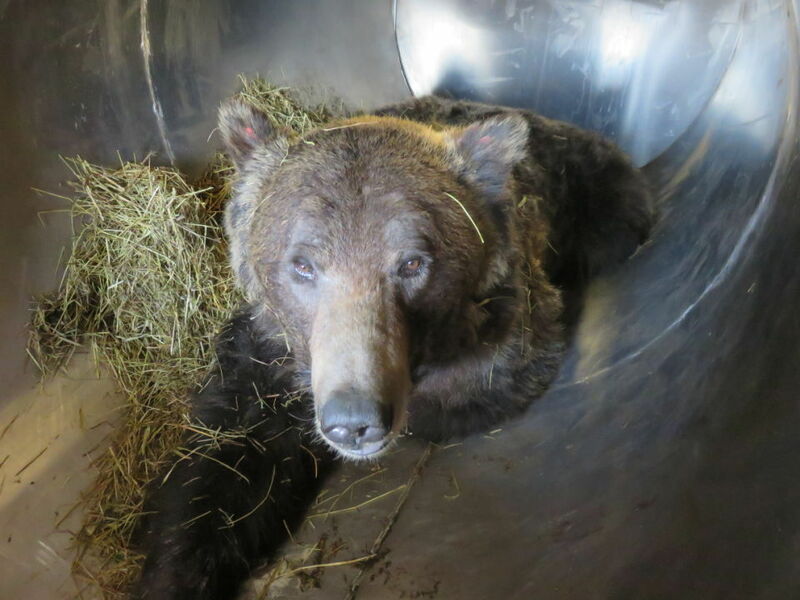 This 2011 photo from the Bozeman Daily Chronicle is of a trapped grizzly bear that was relocated from the Red Lodge, Montana area to the Gallatin area north of Yellowstone National Park after it killed a cow. The cowboy called them and told about the havoc being created by a bear that summer in 1992. He had a fresh calf down, killed the night before by the marauding bear. Fish and Game set a trap over it and by morning had captured a 600 pound bear – “the meanest, hairiest, biggest thing” the cowboy had ever seen. They measured its claws, its weight, took its temperature, plucked fur samples, and put a collar on the bear. Then they prepared to release it. But the Fish and Game folks refused to budge. They turned the bear out and the killing went on. When the cowboy notified them of the increase in kills, they decided to run a study. Fish and Game called it a study of cattle in grizzly bear range. The Cowboy called it a study of grizzlies on cattle range. They argued the semantics on nights in the trailer while the Fish and Game folks used telemetry to watch the bears as they moved into the basin where the cattle were bedded for night. On the screen the cowboy watched the blips moving and outside the cows became restless, then began bellowing and screaming. Eventually he could no longer bear to see it and quit spending nights on the allotment with his cows. They studied the grizzlies for 3 years. The cowboy contended that death losses were up because of bears. The researchers said no. The cowboy was responsible for finding the proof of kills, something that required 5 hours a day in the saddle tracking bears and finding cow carcasses. The researchers suggested mortality tags for the calves ears the following summer. The researchers never made the correlation between the herd’s obvious stress and the deaths of 2 month old healthy animals. Bear kills increased to 10% of the herd and in 1998, the cowboy figured the bears ate 57,000 pounds of beef. He rode with his herd from daybreak, sometimes until midnight. Then he’d say, “Goodnight girls, I’m going home to get some sleep,” and leave them. Now instead of scattering in small groups across the 25,000 acre allotment, they stayed bunched, converging on their bedding area every night to huddle together. It was a very strange sight to see 1,000 cattle sleeping side by side on a 2 acre plot. That summer of ’98 was the straw that broke the camel’s back. On August 2nd he told the herd goodnight. As he drove back in the morning, he stopped at the bridge leading to the meadow where the cows had been bedded. Five separate bears had left their tracks on the road and bridge. The cows were up on a ridge, huddled together. When they saw him, they turned and headed for home. He caught them at an old logging road and turned them back. He fought them for the rest of the day. With the help of his dogs he could shoo them back up a ways and hold them for a couple hours, and they they’d be on the move again. It was as if he were holding back a flood of refugees trying to leave a homeland that had been taken over by terror and bloodshed. At 2:00 that afternoon, the rain was pouring down outside and, exhausted, the cowboy had flopped down in his cabin. He was roused by a neighbor at the door telling him that he had 500 cows on the highway headed for home. He got the dogs and his pickup, got behind them and turned them once more. He spent the night with them and they eventually stayed put. He and the cows won’t go back the allotment this summer for “love or money.” The cows will spend their time on a 9,000 acre fenced pasture in Idaho. 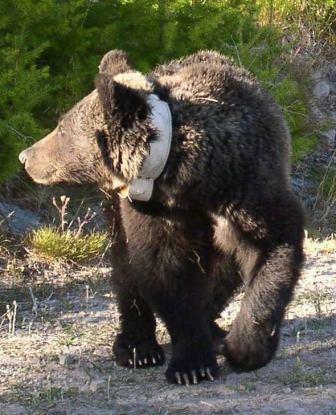 The cowboy will spend his summer riding the lower allotments, the ones outside the recovery zone, to see if the Bears move down to a new food source. “I have a plan,” he says. The Forest Supervisor, who shook hands with the ranchers and told them that predatory bears would be removed, is long retired. He lives in Jackson and the cowboy has lunch with him occasionally. “He always apologizes. Says he didn’t realize the ramifications of what they did back in 1982.” One of the ramifications was that once he retired, the Supervisor’s successors didn’t read the Recovery Plan the same way. The part they read was that all the conflicts would be resolved in favor of the bear. New interpretation meant no removal of predatory animals. But, outside the recovery zone, the plan states that “all conflicts will be resolved in favor of the previous user.” So the cowboy will ride his neighbors’ allotments, looking for signs of the bears. “You see,” he said, “I know bears and I know how to track them. So I’ll help those guys out.” And when they kill, as he knows they will, then they’ll have to be removed. That’s not the end of the story, but it’s all of the story that I know. There are plenty of ways to look at things. This is how it looks from the back of a horse, trying to take care of the herd. Stress Spreads: What’s Pee Got To Do With It? Thank you for sharing Kathy, the solid tenacity of that rancher in solving a problem to the best of his ability is solid testament to what ranching is about. It cost dearly, but what he learned in the process will and am sure helps others in like boats.